A twist on your regular dish. These are creamy, sweet, and oh, so good! They are very easy and pair well with a savory main course. Try them! I don't think you'll be disappointed. Total Time: Around 40 minutes total. Peel, cube and boil your sweet potatoes until soft. Drain, and return to stockpot. Add milk, sugar, butter or margarine, and pumpkin pie spice to pot. Blend with an electric hand mixer until super smooth. 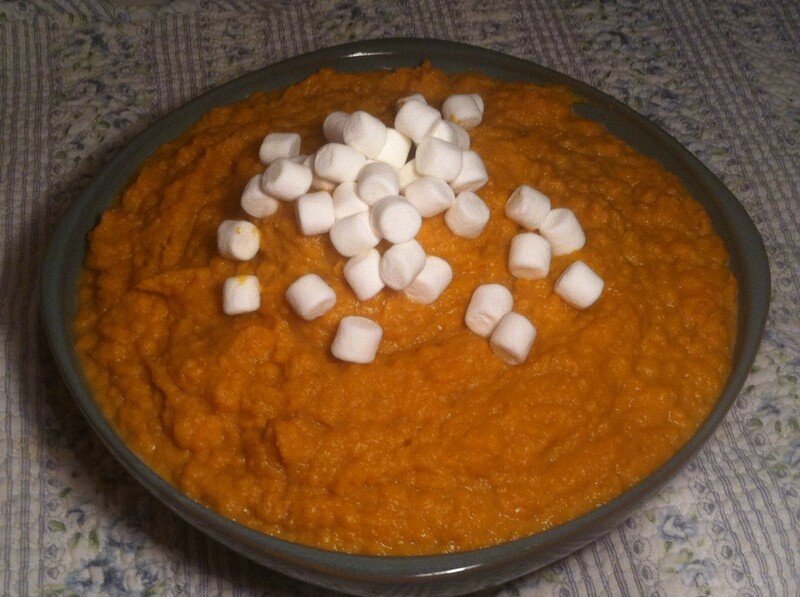 Transfer to a serving dish and top with a handful of marshmallows. Why? They taste good and look cute! P.S.You could halve this recipe for a smaller yield. Those look so good. Love the marshmallows on top! Tried this. My kids loved it, they said it tasted like dessert. These look real good, regular mashed potatoes can get so boring. Thankyou so much for sharing this recipee. My momma always made these so I never learned how to make them. She passed away a few years back and this is the first recipe I have found that comes close to hers.